Here is wave study number 12. I did take it in the wan gray light of day today. Unfortunately this particular canvas had a lot of wrinkles which show up in this picture. It doesn't show up as much in real life. The second batch of canvases I am preparing do not have those wrinkles. I took an extra step to hopefully eliminate them. I know these are studies and I am deliberately using the equivalent of newsprint for painting on but I don't need to make it more challenging than it already is. Before I get started on today, I want to answer a very good question that someone asked in a comment on a previous post. She asked if I was happy with the clouds I painted in a particular study. Good question, the short answer is no! The clouds had simply been blocked in to give me an idea of the light and conditions of the sky and day. If this had been a finished painting, they definitely would have been worked on further. It was a good and well put question and gives me a chance to clarify that none of these wave studies are meant to be finished paintings. 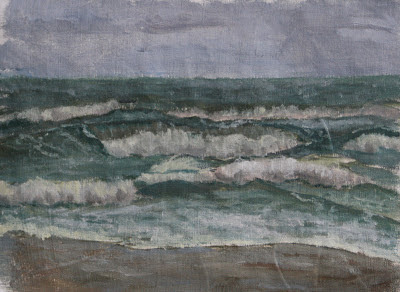 I am doing them to practice and learn to paint and draw waves from life. I really like to blog about this side of being an artist. So many people think artists are just born with talent. Some are born with a bit more hand-eye coordination than others but all have to work at it, even if they start at a very young age. The wave studies are the equivalent of playing scales on a piano. Tedious, sometimes hard and boring, but necessary to make beautiful music, or art. I got my paintings in their frames, labels and cards affixed, hanging wires attached and in protective boxes. They were loaded into the car along with my painting pack, shopping bags, Twill's coat, blanket, treats, leash, water, doggy bags. My old dog was gently helped into the car and off we went. I drove through some serious stormy weather beginning to have doubts about possible painting. Then I realized I forgot my painting umbrella. With the torrential downpour, hail, and rising wind I thought I would have to probably paint from the car even if I did have it along anyway. I got to the gallery, dropped off the paintings, and gave Twill a turn about the town. Back into the car and further north to do the shopping. Well, on and on it went until I was finally able to head back toward home. By the time we were passing my possible painting spots, the tide had turned making those spots too dangerous and I only had about 2 hours of daylight left. We got home cold, tired, and hungry (starting to see a trend here) but got busy and all was taken care of. My mate has started a new job and even though I have carried on with getting out to paint as usual, I miss his help with some of the daily tasks. I need to take a day to get a few more things in place to make it easier to get out and paint and still have some of the home comforts. So, tomorrow I will get things set and Sunday and Monday are family days and a day off. 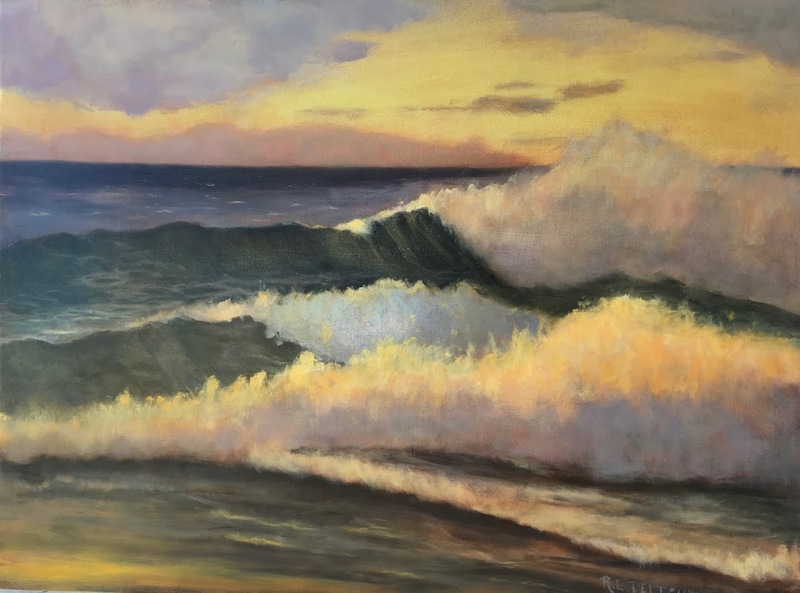 I won't be getting out to paint until Tuesday but I will take the in between moments to do a bit of necessary studying and if I can swing it, get out to do a wave sketch or two for an hour.